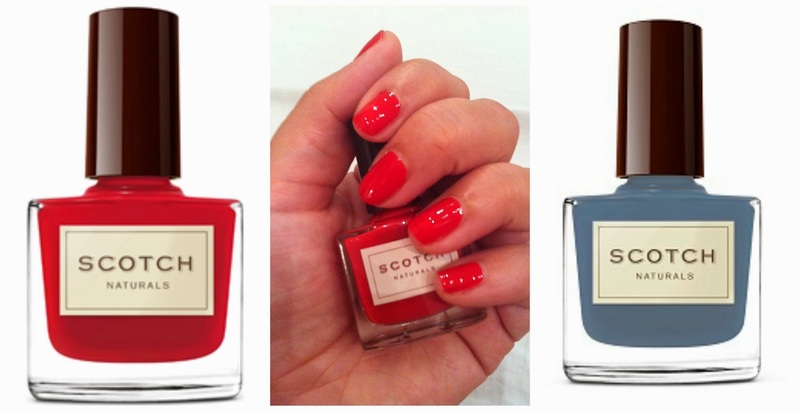 During my search for more natural beauty products, I came across Scotch Naturals Nail Polish, and I am a convert. While had already replaced my regular mani with 3-free nail polishes such as Butter London, I was fascinated with the concept of a truly natural polish that still performed well. Scotch Naturals are a line of water-based nail polishes, and go far beyond 3 free, while still offering long-lasting salon quality. These colours are perfect for fall and then right through winter – the muted shades will go with all of the autumnal colours that you are wearing now, but will be perfect on those grey rainy days as well. The three polishes above are Bannockburn (muted moss creme), Atholl Brose (shimmering linen) and Hot Toddy (dark griege creme). This is the Hot Toddy on my nails, done with the base coat, two coats of polish, and their top coat. As you can see, the two coats gave a rich, opaque finish. Using Scotch Naturals is a unique process, unlike any other polish I have ever tried. The base coat goes on very thinly, but dries to a sticky finish. The nail polish itself totally reminds me of painting with water colours – the texture is the same going on, and the dried polish looks and feels just like them, too. Once you add the top coat, you end up with a gorgeous, rich, and shiny mani. I am in love with this colour – the green tinged charcoal manages to go with just about everything. I also have the Atholl Rose, and another pale pink, Southern Charmer, and I have to admit that these paler polishes take some practice to apply smoothly. While the Hot Toddy went on smoothly and easily, I found it a little harder to get the same even finish with these softer hues. Sometimes I would need three coats, but most often it was simply a matter of making sure that my coats were super thin. Kiltlifter (a true classic red) and Man of the Moment (vintage denim creme) are my current faves for spring (I’m down under!). Both these colours look great with my wardrobe which is mostly navy and white, with the red adding a hit of glam, and the denim a touch of fun. I prefer my nails to be a relatively short “squoval” shape if I am wearing bright colours. As for application, Scotch Naturals recommends putting it on right before bed. As they are water based, they need that overnight curing time before being exposed to water. However, the polish is literally dry within minutes, so it has become an evening ritual a couple of times a week to redo my nails. Finally, the most important question, how do these polishes wear? Firstly, I will state that I hate chipped nail polish, or wear on the tips, so as soon as I see these, the polish comes off. To put it into perspective, Butter London in darker colours usually last 2-3 days on me, lighter colours will make it to day 4 or 5. The Scotch Naturals polish (dark and light colours) made it to day 4 with slight tip wear, but no chipping, and I am sure that people with slightly higher tolerance than me could make it further.